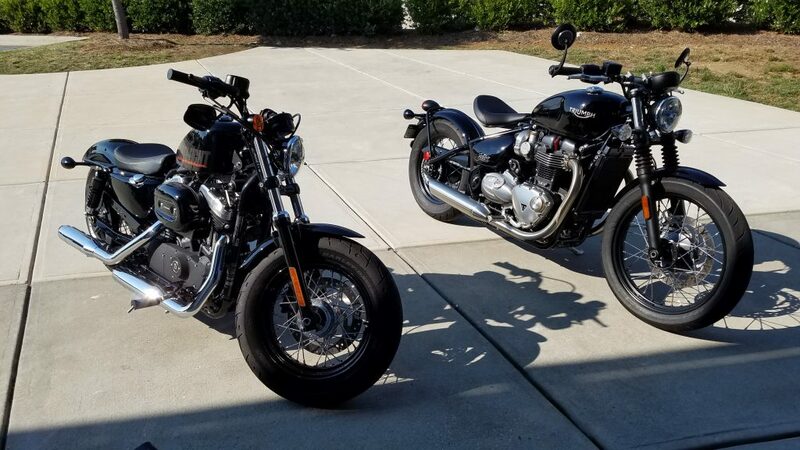 Harley Sportster or Triumph Bobber? Talk about “Two Peas in a Pod”. No two motorcycles are as similar, yet as different as these two. On one hand, we have the classic Harley Davidson 1200cc V-Twin Sporter Forty-Eight. Simple. Burly. Cool. It’s been around for ages. On the other hand is the new Triumph Bobber which came out in March of 2017. It’s a 1200cc Parallel Twin that looks simple, burly and cool… yet hides a lot of technology inside. Where the Harley has electric turn signals and fuel injection, the Triumph has a Ride by Wire throttle, Traction Control, switchable ride modes, and ABS. It’s an actual modern motorcycle and not any ancient agricultural hold-over from the days of horse-drawn plowing. I’ve had messages from guys asking if I wanted to sell my Honda Magna. The answer is a straight up no. However if you offer me a trade… I’d trade it… for a Harley 1200 in awesome running condition and with new tires. You have that, sure, I’ll trade you. If not, no… I’m not selling it. If I sell it, then my wife will take the money… if I trade, well… she doesn’t know how to ride a motorcycle. See what I mean? So yeah, if you have the money to buy – go buy the Harley and then come see me. I’ll even meet you have way, and we can swap titles and keys. So the other day I was sitting at a red light. A dude on a Harley Sportster 1200 pulls up. I didn’t even have to look over to know what he was riding, because it’s obnoxiously loud pipes announced his approach from a block away.